Dan Clowes (1961- ) was born in Chicago, Illinois and studied art at the Pratt Institute in New York. He was part of the ‘alternative comics’ boom of the 1980s and his first professional comic work, the Lloyd Llewellyn series, first appeared in 1986 being a darkly humorous satire of 50s middle class hipster culture - a mix of 1950s pop culture, a retro-cool vision, Raymond Chandler and bad Dean Martin movies. However his next series, Eightball, demonstrated the range and diverse styles with which he is able to bring to his stories. Two films have been made based on his Eightball comics: the Oscar nominated Ghost World (2001) starring Thora Birch, Scarlett Johansson and Steve Buscemi; and Art School Confidential (2006). 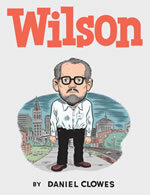 In 2010 Clowes’ all-new graphic novel, Wilson, was his first that had not been previously serialized before being presented in book form. His work has featured in Weirdo, The New Yorker, The Village Voice, Esquire, Vogue, Time magazines as well as numerous CD covers. He currently lives in California, USA with his wife, Erika and son Charlie. Meet Marshall. Sitting alone in the local coffee place. He’s been set up by his friend Tim on a blind date with someone named Natalie, and now he’s just feeling set up. After nearly an hour, when he’s long since given up hope, Natalie appears - breathless, apologizing profusely that she went to the wrong place. She’s too good to be true: attractive, young, intelligent, and she seems to be seriously engaged with what Marshall has to say. There has to be a catch. And, of course, there is. During the extremely long night that follows, Marshall and Natalie are emotionally tested in ways that two people who just met really should not be. A captivating, bittersweet look at the potential for human connection in an increasingly hopeless world. 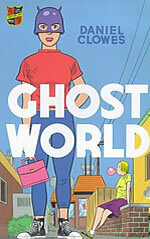 This is another piercing, honed character study as only Clowes can deliver. Due to the re-formatting from its original appearance in The New York Times, it comes in a slightly odd, wide and narrow format and many of the new pages seem to be big images, some of them bleed spreads, so even more widescreen in shape, practically Cinerama. Meet Wilson. An opinionated middle-aged loner who loves his dog and quite possibly no one else. In an ongoing quest to find human connection, he badgers friends and strangers alike into a series of one-sided conversations, punctuating his own lofty discursions with a brutally honest, self-negating sense of humour. After his father dies, Wilson, now irrevocably alone, sets out to find his ex-wife with the hope of rekindling their long-dead relationship, and discovers he has a teenage daughter, born after the marriage ended and given up for adoption. Wilson eventually forces all three to reconnect as a family - a doomed mission that will surely, inevitably backfire. It’s hard to avoid wondering if at least a little of Wilson derives from Clowes himself. It seems likely that this is yet another alter ego, mouthpiece or persona, inspired more or less by the author’s observations and perhaps reflections on surgery a few years ago which cleared up a heart problem, giving him almost a new lease on life. In 2001, Eightball #22 contained twenty-seven interlocking short stories which built upon each other to tell the larger story of the residents of a small American town called Ice Haven and the disappearance of a dopey-looking kid. In Ice Haven, the original thirty-eight page comic is reformated and expanded into an eighty-eight page book. A teenage angst masterpiece, Ghost World is the episodic tale of two above-it-all teenagers - Enid, a restless outcast, and Rebecca, her uneasy counterpart - as they drift through the last summer of childhood, unsure of the next step on the road of life and whether their friendship will last. Perhaps it takes an outsider to understand outsiders, which may explain why Clowes could realise such convincingly tender yet unpatronising portraits of contemporary American teenage girls in Ghost World. Surviving high-school hell brings two opposites together: confused, bespectacled Jewish extrovert Enid Coleslaw (an anagram of Clowes’s name) and her quiet, prettier blonde foil Rebecca Doppelmeyer, united in their contempt for conformity. Their fierce, contradictory closeness is tested and broken by the pressures of life after graduation, which force them to grow up and grow apart. When David Boring, a nineteen year old security guard with a tortured inner life and an obsessive nature, meets the girl of his dreams, things begin to go awry. What seems to be too good to be true apparently is. And what seems truest in Boring’s life is that, given the right set of circumstances (in this case a cascade of vengeance, humiliation and murder) the primal nature of mankind will inexorably come to the fore. 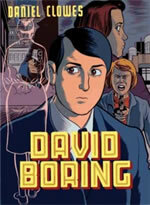 Clowes works in a subtly different register in his lower key character studies, recounted in the first person and drawn more realistically, culminating in David Boring. Boring, a former film-maker in high school, lives as if he is directing a movie of his life, detached behind the camera, always casting for his ‘feminine ideal’, until he finds her and loses her. Estranged from his mother, abandoned by his comic artist father, David reads two panels every night, closely, from his father’s Yellow Streak comic, for clues to his parents’ lives and parallels to his own obsessive love story. David Boring rewards close reading too. Clowes is in total control of the precision editing and nuanced narration, which no film could fully capture. It’s the best movie he never made. 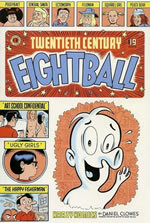 The definitive collection of the best of Dan Clowes’ short humor strips from Eightball. 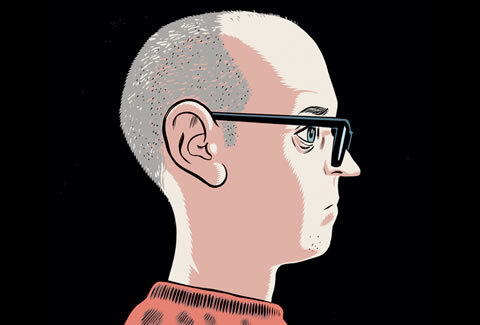 In this collection of interviews reaching from 1988 to 2009, Daniel Clowes discusses his earliest experiences reading superhero comics, his time at the Pratt Institute, his groundbreaking comics career, and his screenplays for Ghost World and Art School Confidential. Several of these pieces are drawn from rare small-press or self-published zines, including Clowes’s first published interview. He talks at length about the creative process, from the earliest traces of a story, to his technical approaches to layout, drawing, inking, lettering, and coloring. 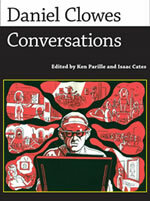 The volume concludes with a 2009 interview conducted specifically for this book. Great to have all these sometimes obscure sources gathered in one place and supplemented with a brand-new conversation.